seven-year-old boy has disappeared from his home in the Birmingham suburbs. But the more Detective Devereaux digs into the missing child's background, the more he discovers about his own past, eventually shaking loose a series of harrowing truths—about bloodlines, mass murder, obsession, and what two damaged detectives have in common with the innocent victim they're so desperate to save. "A fast-moving thriller about a flawed cop searching for an abducted child. Detective Cooper Devereaux returns to duty in Birmingham, Alabama, after an unjust suspension. He's partnering with Detective Jan Loflin to search for Ethan Crane, one in a series of missing children, a 7-year-old foster child who is "not the little angel everyone's making him out to be." Devereaux is no saint either, having led an early life of crime and earned a spotty disciplinary record as a cop. He'd once justifiably shot a kid, and he'd only hurt 'people who deserved to be hurt,' but his captain calls him a disgrace and an embarrassment. Devereaux still dreams about his own disturbing childhood, which turns out to be more relevant than idle navel-gazing. The story's heavy focus on his background fits in neatly with the plot. ... Devereaux is filled with self-doubt—perhaps any good feeling he harbors about himself is a 'false positive' and his true character is 'written in his genes.' Readers who like defects in their heroes will love this guy, who knows he's not as good as he'd like to be. The final twist comes just as all finally seems well with the world. A dark, enjoyable novel. One of Grant's better works." 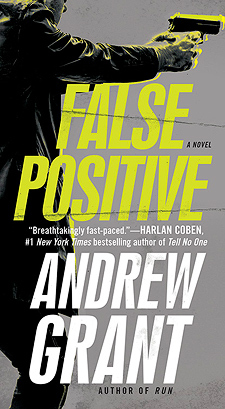 "Grant crafts a psychological thriller that challenges the reader with every new development. The engrossing revelations about Deveraux's past draw out interesting facts about other cast members. Action-driven, the book's pace never stops until the startling conclusion, which will chill to the core. Detective Cooper Deveraux is a wild card. Orphaned young, he was rescued and raised by a cop. He sowed his share of wild (illegal) oats, but got on track and survived the police academy. He still pushes his authority to the limits. A 7-year-old boy has gone missing. Cooper isn't always on the same page as his new partner, Detective Jan Loflin. Orders from above seem to conflict with the leads they're following, so Cooper becomes a lone wolf once again. Unbelievable horrors await the pair as each follows the flimsy evidence to find the missing boy. Neither is prepared for the result."